UPDATED: January 31, 2017 at 11:37 p.m.
Harvard workers with Temporary Protected Status delivered a letter to University President Drew G. Faust Wednesday afternoon calling on her to take more decisive action to protect them from possible deportation. 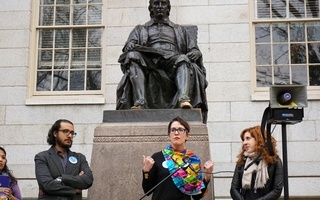 A total of about 50 workers, students, faculty, staff, and supporters from campus unions gathered outside of Faust's Massachusetts Hall office to deliver the letter. Temporary Protected Status is a designation granted by the Department of Homeland Security to certain foreign nationals who are unable to return to their country of citizenship due to unsafe circumstances like an armed conflict or natural disaster. TPS recipients can legally live and work in the U.S. and are immune from deportation. Over the last several months, The Trump administration has terminated the program for citizens of El Salvador, Haiti, Nicaragua, and Sudan, collectively ending protections for over 250,000 people. In the letter, the Harvard TPS Coalition—a group of workers who form part of some of Harvard’s campus unions—asked Faust to support the dozens of University affiliates with TPS by holding a press conference on the issue before Feb. 8. That day marks the deadline for Congress to revisit legislation touching on the fate of undocumented immigrants who have been granted the right stay in the United States through another temporary immigration status program, Deferred Action for Childhood Arrivals. The protesters also asked Faust to write a letter to Congress and President Donald Trump advocating for a path from TPS status to permanent residency for workers and their families. 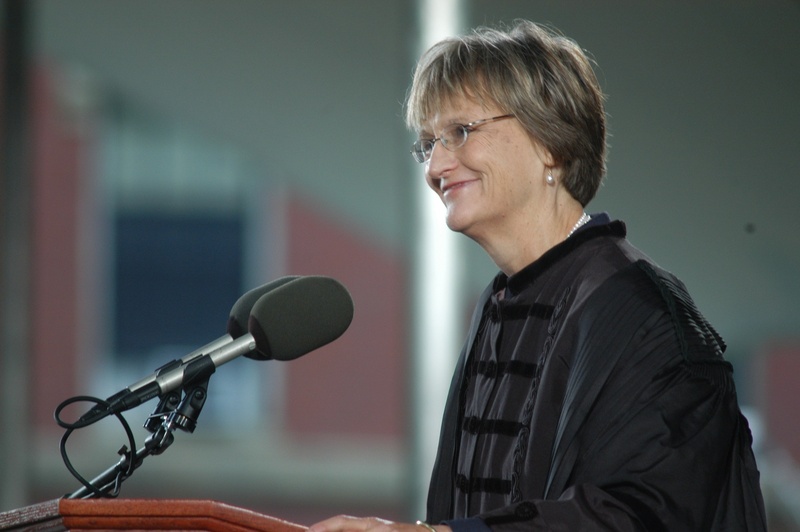 They also requested that Faust encourage other college presidents to take similar steps. 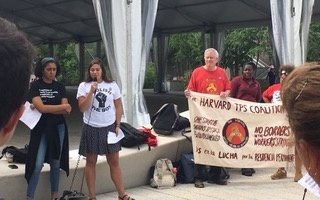 In asking for Faust’s advocacy, the workers’ letter emphasized the potential consequences of Trump’s recent TPS changes, which will likely affect dozens at Harvard. “We will be targeted for violence and could even be killed if we return to what, for many of us, are unfamiliar countries. We are Americans who deserve permanent residency here in the United States,” the letter reads. Members of the coalition posted the letter online to allow students and faculty to sign it. The letter had received nearly 200 signatures as of 11:45 a.m. on Wednesday, when demonstrators delivered to Faust. Harvard University Dining Services employee Martha Bonilla, who attended the letter delivery, said she appreciates that the University has made resources like the Harvard Immigration and Refugee Clinical Program more accessible. But Bonilla said she believes the most effective change will occur when Faust provides a public statement about the TPS issue. In response to a request for comment, University spokesperson Melodie L. Jackson pointed to an earlier statement she wrote on Harvard's behalf. "We are deeply concerned about the administration's recent withdrawal of TPS for those from El Salvador, Haiti, Nicaragua, and Sudan and the impact it could have on members of the community," Jackson wrote in the statement. 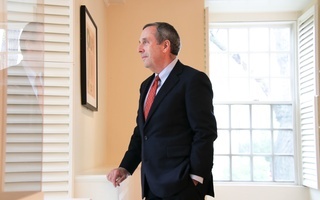 "Our colleagues play a vital role at Harvard and they add to our community in significant ways." The letter also details the experiences of four Harvard workers from El Salvador, the country of origin for the largest group of TPS holders currently living in the United States. All four stories share common elements of uncertainty and fear. Salvadorans have until Sept. 2019 to find a way to legally remain in the U.S. or face deportation. At the letter delivery Wednesday, Doris Landaverde, a Harvard staff member with TPS, said she fears the possibility of being deported back to her home country of El Salvador. “I feel scared because if I have to go back, I won’t have a job, I don’t know how to support my kids, and I just don’t know how I’ll survive,” Landaverde said. Harvard's Student Labor Action Movement—a group of undergraduates that advocates for workers’ rights—cosigned the letter and has been an active participant in the immigrant rights activism on campus. Two faculty members also spoke at the letter delivery event to show support for TPS workers. “We should not let this cruel and inhumane policy tear families and communities apart,” Mary C. Waters, a Sociology professor who studies immigration issues, told the crowd gathered outside Massachusetts Hall. 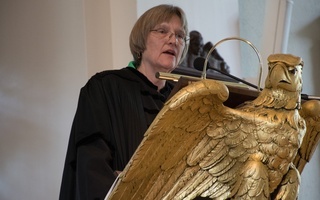 Kirsten A. Weld, a History professor, also spoke at the event. “Workers are as much of a part of this community as professors and students; an attack on you is an attack on our community,” she said. The Trump administration announced Wednesday it would allow the nearly 7,000 Syrians with TPS to retain their protections for another 18 months, though this group makes up a small fraction of the total TPS-holding population in the United States.